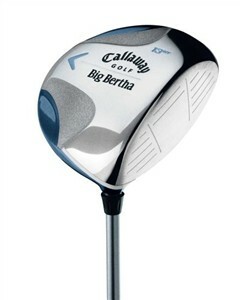 The things I like best about this driver are the draw biased weighting and the high loft. (Make sure you get the 13 degree.) The designers have made the internal weighting to promote the feel of closing the clubhead. Returning the clubface to square is the single skill that we struggle with the most when learning to swing our driver. The high loft will help you get the ball up and flying as opposed to skidding along the ground and killing poor defenseless birds and squirrels. However, I'm not a big fan of the 440cc clubhead. Some of you may like the look of the compact head, but I'd prefer you go with a driver with the full 460cc clubhead. I would recommend the Women's Burner Driver 2009. This is the full enchilada with an extremely large hitting surface. I also like the TaylorMade Lady R9 Supertri Driver, because you can adjust the driverhead to your swing. Adjust it closed to help you square the driver, and after you improve, adjust it back to neutral.